This chapter describes a design model that InterSystems customers have used successfully to build interface routing solutions. As such, it can be thought of as a collection of best practices for developing a routing production. This chapter describes only one approach. Other implementation strategies can be successful as well. Each organization has its own standards for writing code and conducting programming projects. 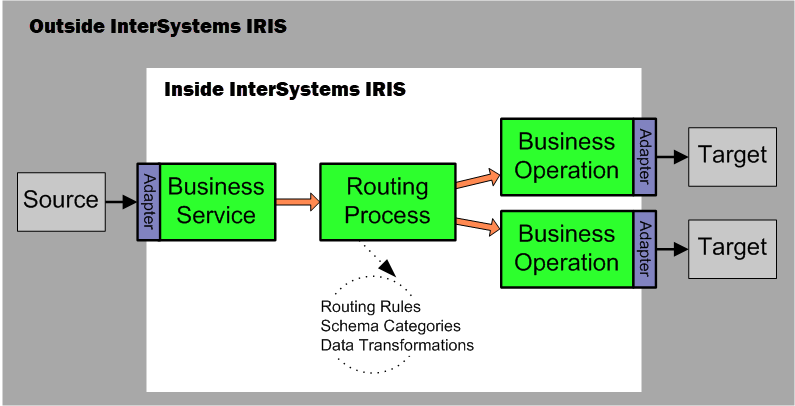 This chapter simply describes those aspects of a routing production that are unique to InterSystems IRIS™ and that benefit from a carefully structured approach. A sequence manager ensures that related messages arrive at their targets with the proper sequence and timing. A routing process has a routing rule set associated with it. 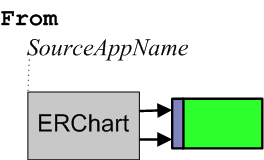 Depending on how the rule set is defined, and depending on the type of message that arrives from the source application, the rule set identifies which of its rules should execute. More than one rule can execute, in sequence, but for simplicity the following figure shows the case where the rule set chooses only one rule. 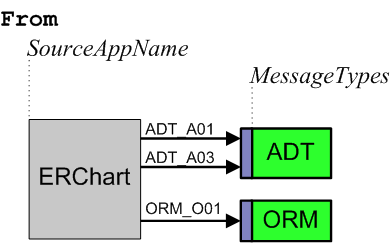 From this point, as shown, a rule can either delete the message or it can send the message to a destination within InterSystems IRIS. 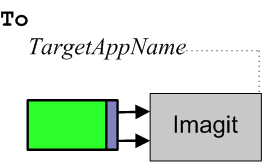 If this destination is a business operation, the message then leaves the production on its way to the target application. 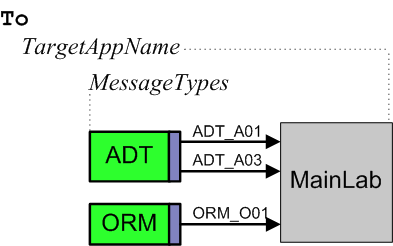 Ideally, an application provides an application specification document, or implementation guide, that explains which types of messages the application can send (or receive), and which message segments and pieces of each segment the application sends (or expects) for these events. A formal document of this kind is extremely detailed, and extremely useful. If a specification document is available, the administrator for the application can show it to you, and can explain to you which of the many possible messages are actually in use in the enterprise. As an alternative to documentation, or to validate that the existing documentation is correct, you can examine the messages themselves to determine which types the application sends or expects to receive. Ask the application administrator to provide you with a sampling of the message data, saved in files. Application  Briefly identify a specific application, its role in your system, and the person to contact about any issues or problems with this application. Ideally, this description makes sense to members of your organization who do not use InterSystems IRIS, but who are generally familiar with how the system works. Sends  The message structures that this application contributes to the information system. Receives  The message structures that this application consumes from the information system. ACKs  Acknowledgment details. Are ACK and NACK messages expected? Is there a separate interface for sending and receiving them? Should the production generate the ACKs and NACKs, or will the receiving application do so? Provide one business service for each application that sends messages into InterSystems IRIS. This is an application that has at least one entry in the Sends column of the production spreadsheet. Alternatively, when hundreds of users of the same clinical application are sending data into the enterprise, it can be useful to route all of these messages into InterSystems IRIS via one business service that may or may not stay permanently connected to any single instance of the application. Provide one routing process for each business service. 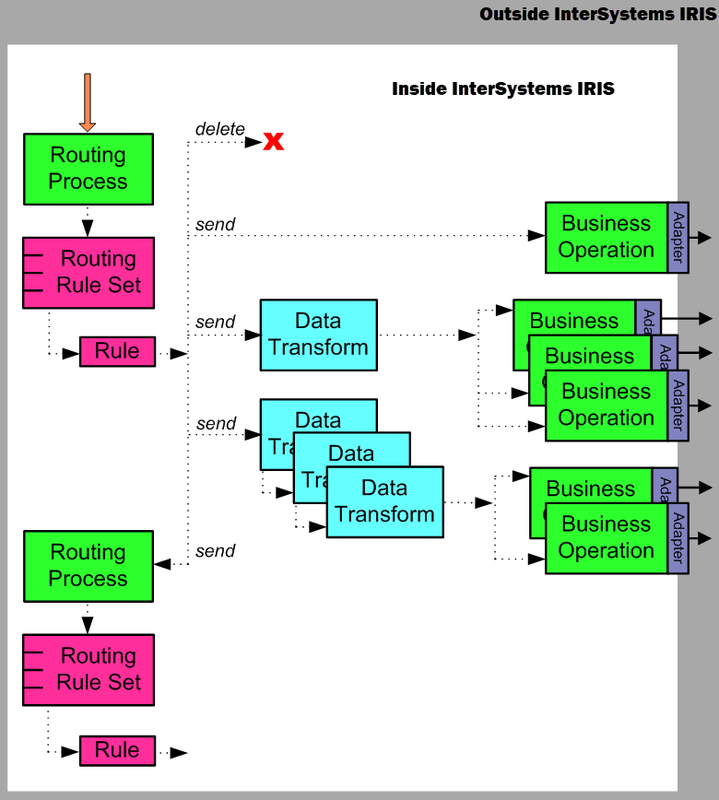 The routing process can route messages based on the contents of the message itself, or information stored in InterSystems IRIS. If the routing depends on the contents of other messages, or requires invocation of external applications to determine the routing, the routing process should be a BPL business process that calls out to other classes. However, in most cases a routing process based on the built-in routing rule engine is sufficient. Provide one business operation for each application that receives messages from the production. This is an application that has at least one entry in the Receives column of the production spreadsheet. Keep business services and business operations simple. In general, it is not necessary to write your own code for business services or business operations. 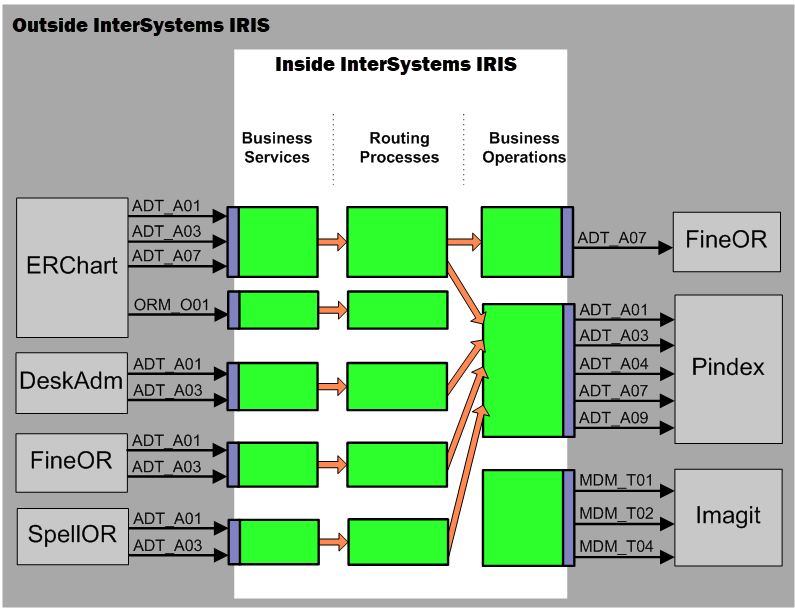 Choose the built-in classes that InterSystems IRIS provides. This choice gives you the correct adapters automatically. Configure these classes using Management Portal settings. Typically you will develop your production incrementally, one interface at a time. There is a temptation to name items as you go, and to allow naming conventions to grow incrementally along with the project. InterSystems recommends you do not take this incremental approach to naming conventions. For rules on configuration item names, see “Configuration Names,” in Configuring Productions. If you have decided to organize an interface so that one application sends messages into InterSystems IRIS via more than one business service, also include a keyword that classifies the MessageTypes that pass through each business service. 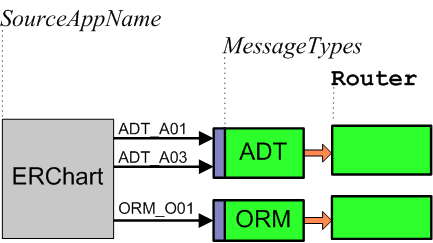 A typical MessageTypes keyword uses the first three letters of the message structure. In this case the convention for the business service name is FromSourceAppNameMessageTypes. If you have decided to organize an interface so that one application receives messages from InterSystems IRIS via more than one business operation, also include a keyword that classifies the MessageTypes that passes through each business operation.